Add Daily Power – For Now. For Life. Our powerfully different approach to spicing includes all of the following with more to come! This naturally sweet tropical blend features Ceylon Cinnamon with a hint of ginger and orange. CinnaPeel Spicer perks up just about anything – oatmeal, smoothies, desserts, fruit, teas – while you enjoy the special benefits within the spices and the peel. Give your veggies a dash of attitude with this scent-sational blend — no salt required! Studies show that turmeric and pepper work better together (gotta love spice synergy), and that garlic and onion with fiber-rich foods can provide all sorts of nutritional perks. So sprinkle Vegitude Blend generously on roasted, sautéed, and stewed dishes. Spice synergy at it’s best! This sensuously soothing blend produces a sweet chocolatey flavor with no sugar! Perfect for bedtime… or anytime. Just add 1/2 teaspoon of Golden Milk ChocoLatte to a cup of warm dairy-free milk. Also try adding a teaspoon to your smoothie or sprinkle it on cereals and desserts for added deliciousness. For extra nutritional credit, be daring — add a tiny pinch of black pepper. This flavorful, colorful blend perks up any protein. You also gotta taste what it does to roasted veggies, stews, and hummus! 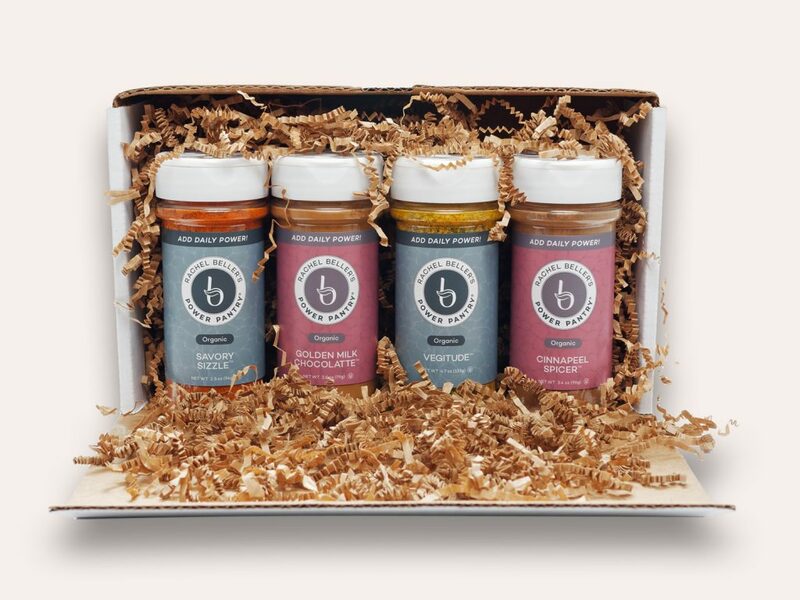 Savory Sizzle combines antioxidant-rich ingredients — the spice synergies go far beyond the usual turmeric-pepper mix — with the scintillating scents of paprika, cumin, and cayenne. Want sweetness without sugar? Add Ceylon cinnamon to EVERYTHING: hot and cold beverages, oatmeal, fruit, desserts, stews, even roasted veg. Unlike common cinnamon (cassia or Saigon) found in most supermarkets, this “true cinnamon” from Sri Lanka tastes lighter and sweeter, and studies show that it offers more than what meets your taste buds. I love spices — naturally — and think everyone should use them. Not only do spices take healthy dishes from bland to in-demand (oatmeal? no problem! steamed broc? bring it on! ), but my years of research revealed that spices also add “daily power” in the form of nutritional value. Thus, Power Pantry was born: a powerfully different approach to spices. But it wasn’t overnight. I didn’t want to compromise quality and just slap my name or endorsement on someone else’s products. My team and I spent years researching and crafting unique spice formulations, testing different combos to deliver the most irresistible flavors, and sourcing the cleanest, highest-quality, 100% organic ingredients. THANK YOU for trying Power Pantry! I hope you’ll find my spice blends as fun and flavorful as I do (my family and I boost our meals with least one Power Pantry product every day). Please contact me on social media or on my site at BellerNutrition.com — and stay in touch to learn about the latest Power Pantry releases, recipes, special offers and more.